DaviesBouldinEvaluation is an object consisting of sample data, clustering data, and Davies-Bouldin criterion values used to evaluate the optimal number of clusters. Create a Davies-Bouldin criterion clustering evaluation object using evalclusters. eva = evalclusters(x,clust,'DaviesBouldin') creates a Davies-Bouldin criterion clustering evaluation object. eva = evalclusters(x,clust,'DaviesBouldin',Name,Value) creates a Davies-Bouldin criterion clustering evaluation object using additional options specified by one or more name-value pair arguments. 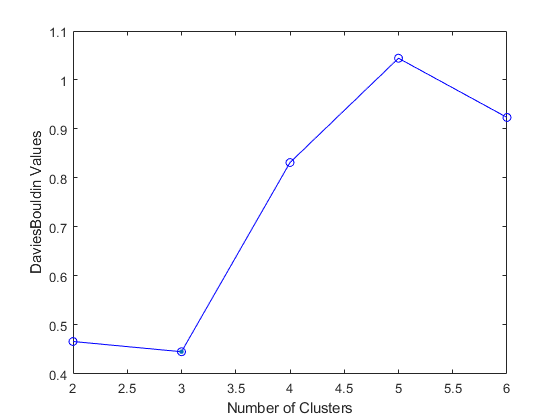 Example: 'KList',[1:5] specifies to test 1, 2, 3, 4, and 5 clusters to find the optimal number. 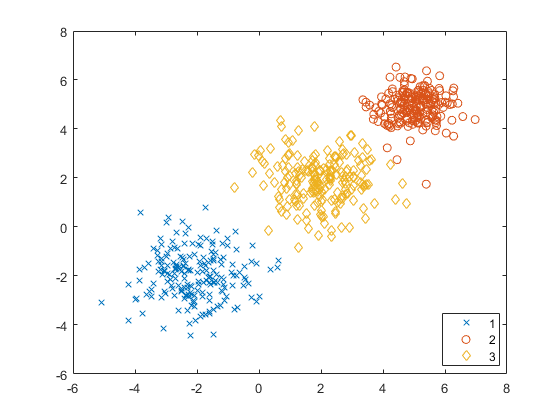 Clustering algorithm used to cluster the input data, stored as a valid clustering algorithm name or function handle. If the clustering solutions are provided in the input, ClusteringFunction is empty. Name of the criterion used for clustering evaluation, stored as a valid criterion name. Criterion values corresponding to each proposed number of clusters in InspectedK, stored as a vector of numerical values. List of the number of proposed clusters for which to compute criterion values, stored as a vector of positive integer values. Logical flag for excluded data, stored as a column vector of logical values. If Missing equals true, then the corresponding value in the data matrix x is not used in the clustering solution. Number of observations in the data matrix X, minus the number of missing (NaN) values in X, stored as a positive integer value. Optimal number of clusters, stored as a positive integer value. Optimal clustering solution corresponding to OptimalK, stored as a column vector of positive integer values. If the clustering solutions are provided in the input, OptimalY is empty. Data used for clustering, stored as a matrix of numerical values. Evaluate the optimal number of clusters using the Davies-Bouldin clustering evaluation criterion. Generate sample data containing random numbers from three multivariate distributions with different parameter values. Evaluate the optimal number of clusters using the Davies-Bouldin criterion. Cluster the data using kmeans. The OptimalK value indicates that, based on the Davies-Bouldin criterion, the optimal number of clusters is three. Plot the Davies-Bouldin criterion values for each number of clusters tested. The plot shows that the lowest Davies-Bouldin value occurs at three clusters, suggesting that the optimal number of clusters is three. 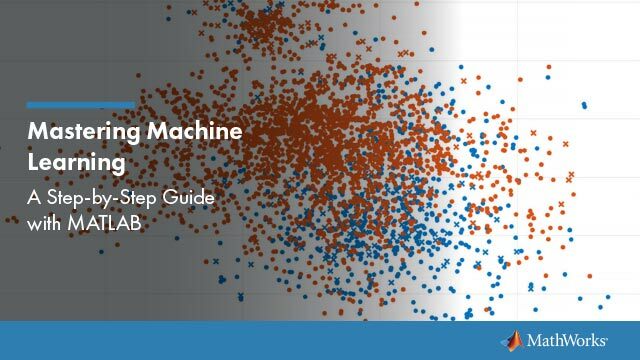 Create a grouped scatter plot to visually examine the suggested clusters. The plot shows three distinct clusters within the data: Cluster 1 is in the lower-left corner, cluster 2 is in the upper-right corner, and cluster 3 is near the center of the plot. d¯i is the average distance between each point in the ith cluster and the centroid of the ith cluster. d¯j is the average distance between each point in the jth cluster and the centroid of the jth cluster. di,j is the Euclidean distance between the centroids of the ith and jth clusters. The maximum value of Di,j represents the worst-case within-to-between cluster ratio for cluster i. The optimal clustering solution has the smallest Davies-Bouldin index value. Davies, D. L., and D. W. Bouldin. “A Cluster Separation Measure.” IEEE Transactions on Pattern Analysis and Machine Intelligence. Vol. PAMI-1, No. 2, 1979, pp. 224–227.